You need a paint strong enough to handle everything life can throw at it. 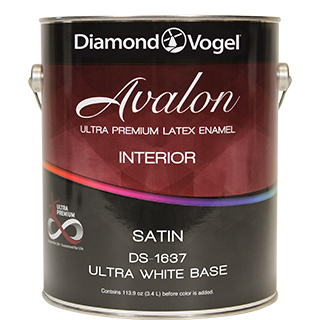 That’s why we made Avalon, the most durable, washable wall paint we’ve ever made. Most stains effortlessly wipe away with a clean cloth and water ensuring your paint continues to look great. Avalon is extremely durable, outlasting competitive products after repeated scrub cycles, making it an excellent choice for your home. Avalon is incredibly easy to use allowing you to quickly finish your project and make it look great. We created a revolutionary new base called Ultra White Base. It is exceptionally white ensuring colors have incredible depth, vibrancy and clarity. You’ll notice the difference. Ultra White Base also has truly remarkable hide allowing you to paint more surface area with no additional effort. It is simply the best interior paint we've made.